Last night, I got Calliope from the airport and hung out with her for a little while.Â She’s here for a conference and I’m not sure that I’ll get to see her again (BOOO). 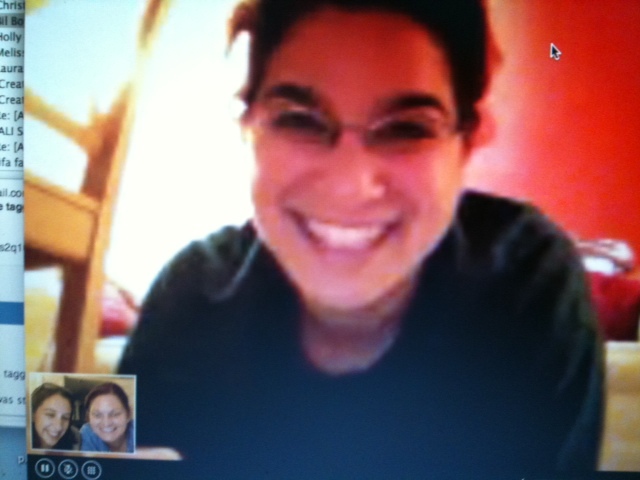 We talked to Mel on Skype while I was there. I love my friends, by the way.Â I got home (pretty much in the middle of the night, even though I didn’t stay nearly long enough) and told Matt that I want to move all my friends to live on the same street as me. Matt put Elizabeth to bed last night, since I was going out.Â She goes to bed for him now.Â She didn’t for years.Â Mama was the only one who would do.Â Which meant that when I went out, she stayed awake for hours crying in Matt’s arms.Â So we totally appreciate the ease at which she goes to sleep now. So, Elizabeth went to sleep just fine for Matt.Â But she woke up crying at 2:55am.Â I went in her room, patted her back, and she went back to sleep.Â Then I realized that pretty much every night that Matt puts her to bed (I put her to bed probably 97% of nights), she wakes up crying in the middle of the night.Â She’s looking for me, checking to see if I am home.